PRIESTS Live! And Happy Mother's Day to all you Mamas! 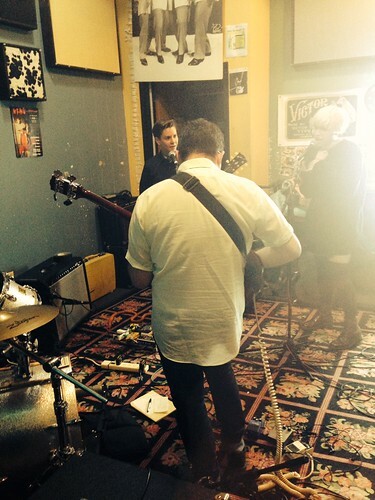 PRIESTS Live on The Cherry Blossom Clinic on WFMU! Listen to Priests on Bandcamp. June 2 - Washington, DC @ Black Cat (1811 14th St NW). With The Shondes and Pink Wash.
June 3 (early) - New York, NY @ ABC No Rio (156 Rivington St). With Incircles and Pour The Pirate Sherry. June 3 (late) - New York, NY @ Cake Shop (152 Ludlow St). With In School and Sediment Club. Special Thanks to Brian Turner! Good high-powered afternoon, dear listeners. And Terre T.
Terre T. your're being a bad girl. And I LIKE it! Expecting Pink Floyd and Can now. Hoping for GBV. DJ Terre T is the Mother of Rockin' Saturdays! fill up benny hill's left shoe? Profile: Band never famous in America. I'm sorry I wasn't around, Callie! I wish I could relate with all these nice things being said about my passive-agressive mother. I don't have a mom anymore:-(:::: she passed away 5 years ago. This is not your mother's Mother's Day celebration. Thanks for the GBV, Terre T! Sorry to hear that BiPolar guy. 21 year passed for me. @Bipolar Guy. This is my first Mother's Day since the passing of my mom. I wish you could have had my mom for a mom, then you wouldn't feel so bad. @Whooda my mom wasn't the best mom either. She never wanted a boy. And I got my share of bearings from her and dad. Well, this is awkward-town now. Aloe Blacc's Discogs bio is longer than Areosmith's! Great show so far Terre! Stuck doing yard work, but enjoying the music while working. I went out to do laundry right when the rain hit. Soaked on the walk to the laundry just down the block. America! That Supremes song made me cry too, Terre! hey Terre and everyone :) been listening in the car as I go about running errands :) great stuff as always TT! TERRE T T T T T T T!!! Aw Bipolar Guy, I'm sorry. A good cry now and again is good for you, though! Everybody's doing the Jaaaaaaz Fart! This new set of music is where the highway construction zone ends and the cars zoom back to danger speed. Are the Priests named after the Dom Mariani song? They'll be plenty of links in the playlist during their live set, Noah! TT & Paulie B. I love the Targets almost as much as you guys. Hi all- Sorry to all the peeps missing their moms. All the best to u. And hey "APPLES" i cant play yr GM Thog request -2 many curses! "Nocturnal Missions" is power pop bliss! Hmm, they're playing in Montreal. I may have to check them out! If you start saving today, trust me, you will have enough when you get old.